Washington State has opened an application process for organizations to apply for funds through the Federal Victims Of Crime Act (VOCA). If you are an organization in Washington that has a proven record of serving marginalized populations and underserved communities, you may be eligible to apply through this RFP process. The maximum grant award is $500,000. Through our VOCA Funding Toolkit EJUSA can help groups determine if they are eligible, answer questions about the process, and provide some support for your group’s application. Download the toolkit here. Find all official application materials here. California has opened an application process for organizations to apply for funds through the Federal Victims Of Crime Act (VOCA). If you are a Native American tribe, tribal nonprofit/community-based organization, or tribal consortium operating within a Tribal Court system in California, you may be eligible to apply through this RFP process. The maximum grant award is $200,000. Through our VOCA Funding Toolkit, and assistance from our Grassroots Capacity Building Specialist, EJUSA can help groups determine if they are eligible to apply, answer questions about the process, and provide some technical assistance for your group’s application. Please contact Latrina Kelly-James at latrinakj@ejusa.org or (203) 823-5826 or download the toolkit here. A hospital-based trauma violence intervention program, Detroit Life is Valuable Everyday (DLIVE), believes the ideal time to approach violence victims about changing their lives is when they’re hospitalized, and thinking about how they got there. EJUSA has been working with DLIVE to grow their capacity so they can apply for federal funding to expand their program. Imagine surviving human trafficking, sexual abuse, assault, domestic violence, and gang exploitation all before the age of 13. Pastor Gwendolyn Cook sees it every day. She is the founder and director of Women Walking in the Spirit (WWITS) Girls Mentoring Program in Camden, NJ. Her organization works with young girls returning from juvenile detention at Hayes Secure Care Facility for Girls in Bordentown, NJ. The girls have survived severe and often multiple forms of trauma. I’ve worked with Pastor Cook for over a year, helping WWITS to frame a narrative for their work and building a program model so they can gain new funding sources. WWITS is one of dozens of grassroots organizations across the country that I’ve had the honor to support over the last year and a half. These groups are providing healing for communities wrecked by violence, victimization, and trauma. I help them build capacity to access and maintain federal Victims of Crime Act (VOCA) funding, preparing them for long-term success and creating more resources for healing. I am most inspired by the many groups who work with little to no funding, with volunteers as the lifeline — groups like Pastor Cook’s. This profile is part of EJUSA’s series on National Crime Victims Rights Week. Florida has opened an application process for organizations to apply for funds (pdf) through the Federal Victims Of Crime Act (VOCA). If you are an organization in Florida that works with crime survivors, you may be eligible to apply through this RFP process. Note: the deadline is fast approaching February 24, 2017. Organizations must register in Florida’s E-Grants system in order to access the RFP. 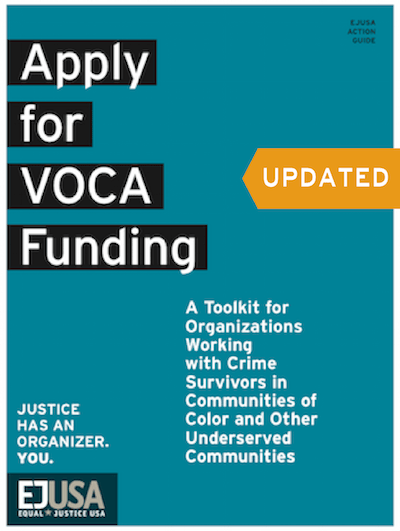 EJUSA has released its updated “Apply for VOCA Funding: A Toolkit for Organizations Working with Crime Survivors in Communities of Color and Other Underserved Communities.” This revised toolkit reflects the new guidelines released by the federal Office of Victims of Crime (OVC). Many of new guidelines recognize the marginalization of underserved survivors and are a step in the right direction in terms of meeting EJUSA’s goals of brining equity to services for survivors. Since its founding more than 5 years ago, Mothers of Murdered Children Detroit (MOMC) has provided support, advocacy, and healing services to mothers and families who have lost loved ones to violence. From helping with funeral arrangements and facilitating grief support groups, to accompanying families to court and helping grieving grandmothers gain legal access of their grandchildren, MOMC is there for families who are trying to rebuild their lives after surviving violence. EJUSA has been giving technical support to MOMC for several months, helping them build their capacity and prepare to apply for VOCA funding. Grassroots Capacity Building Specialist Latrina Kelly-James helped them organize all of their services and support into a program model, worked with them to create a client tracking system, developed program narratives, and coached the staff on building relationships with local and state resources. Pennsylvania has opened an application process for organizations to apply for funds (pdf) through the Federal Victims Of Crime Act (VOCA). If you are an organization in Pennsylvania that works with adult and child survivors of child sexual abuse, you may be eligible to apply through this RFP process. The maximum grant award is $50,000.